Bill Cason was recommended by our realtor, and after the first meeting, we knew we didn't have to look any further for the right builder to build our custom home. His professionalism, expirience, and integrity was evident from day one. The finished home built by Cason Builders where we met was proof of the pudding for it showed top-notch quality work. Bill listened as we explained our specific needs for a wheelchair accessible home, and offered great suggestions and alterations to his house plans in order to make it so. He is always accessible and communicated with us at each step of the process. As the construction progressed, he and Don thought ahead and made adjustments with our needs in mind. We couldn't be more pleased with the outcome! Thanks to Cason Builders and all of the quality buisnesses and people they work with, the whole home building process was easy for us. The project went smoothly and efficiently, and the house was done quicker than we expected. We now have a beautiful new home just the way we wanted. 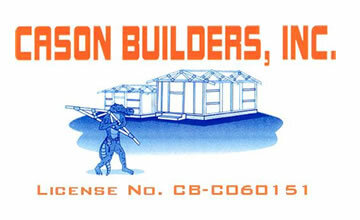 We enthusiastically and without reservation, recommend Cason Builders! Dear Bill, We are now starting to settle into our house and it finally feels like ours. Thank you so much for all your hard work in making our dream house a reality. There is not a single thing about the house we would change. We greatly appreciate you helping us along during the building process. We know there is not a single builder in town that would have been as open and honest about the job with each step of the way. You really looked out for our best interests and found a way to make evrything work. We are also very satisfied with everyone who had a hand in building our home. You have very kind and honest people working for you. There really are not enough words to express our gratitude. We know that the quality and honesty of this work is not easy to find. Hey Bill, We love the new house and thanks for building a great home for us. You and Don were awesome to work with. People drive by all the time real slow looking at our house. Everyone asks who built it and they love it. Cason builders built our home in 2015. It survived hurricane Irma like a champ. Bill, Thanks for your efforts and honesty. It is rare in this day to find an organization of any kind that exemplifies professionalism, expert craftsmanship, fairness, and honesty, but Bill Cason and his team displayed all of them throughout our major remodel project. On a short timeline, Cason Builders Inc not only came through, but did so at the highest level under difficult circumstances. Highly recommended! Dear Bill, We are so appreciate of the outstanding renovation you did on our house in Gainesville! We felt so confident knowing that you would see to every detail of the numerous carpentry, mechanical, plumbing, electrical, tile, drywall, and painting projects. You came through for us in every way with fair pricing, timely completion, and high quality construction across the board. Your knowledge, expertise, honesty, and easy going communication style made it a pleasure to work with you. The house is absolutely stunning and we owe it all to you and your team of skilled subcontractors. Bill and Don, Thank you very much. We appreciate all your hard work to build such a beutiful home for us. You use some of the best subcontractors in our market who are dedecated to quality. We also are grateful for your patience in answering all our questions and dealing with our change orders. We are very happy with the home and the entire process. Bill, Today marks our first week and we truly love our home. You and your crew did an incredible job. Matt and I are so happy we selected you to build our home. We plan to host an open house for our friends and families and plan to send an invitation to you and your family as well. We can't wait to show off your work! Dear Bill, Just wanted to thank you for the wonderful job you did at our home. Our new workshop, fire pit , driveway, and all the other projects you did with us turned out better than we could have imagined. Your attention to detail and always keeping us informed of the progress kept our minds at ease during the process. You and your crew members were always polite and treated our home like it was your own. We could not have had a better experience and will certainly contact you for future projects. Thank you so very much for the beautiful work. I couldn't be more pleased. The room is exactly what I wanted. Thank you for excellent work. You and your sub-contractors were very professional and do excellent work. Hi Bill, I appreciate all the hard work of everyone. Mitch did such an awesome job, I can't say enough about his work ethic, expertise, and professionalism. If we need anything done in the future, we will be calling you. Thank you, I'm very happy with the job on the garage that you did for me. We recently moved to North Central Florida from the Tampa area to escape the traffic and other headaches. After checking out several other builders in the area and looking at some of Cason's past projects we decided he was the one we wanted to build our home. We chose the Brittany model and made several modifications (all with no issues or delays). From day one we were very impressed with Bill's attention to detail and quick responses to our emails, phone calls, and texts. He kept us in the loop on each step of the building process. He and his team have been working together for a long time and the quality of the workmanship was second to none. Even after the construction was completed and all the construction draws were paid, Bill followed up to make sure we were happy with the home and told us to call him if we had questions or if there was anything we needed. We strongly recommend Cason Builders Inc. for any new home or remodel project you may be considering. Dear Bill, I've written this recommendation of your work to share with others. We are very happy (still) with the house Bill built for us 4 years ago in 2010. He is easy to work with, has creative ideas, understands that everyone has unique needs and seeks to meet those needs in his buisness. We recommend Bill Cason without reservation, and his qualities are personable, high integrity, and has good value. Dear Bill, I want you to include this letter in your testimonials. Just a little background with our experience with Bill. He built several of our family's homes on property that we own in High Springs. Also, my mother moved from Naples, FL to be closer to family, and he helped and advised her with the home she bought in Gainesville. Bill also drew the plans to our dream home, which we look forward to building in the future on our family property. We contacted Bill this year, during a very busy holiday season, regarding a renovation in the duck pond area. He accommodoated us with all of our requests, even though he was swamped with other projects, and was still able to complete the renovation in time for us to move in by Christmas. I can't say enough about Bill and his crew, their professionalism, and willingness to work within our budget and time frame. Thank you for your honesty and hard work. We truly appreciate you! Bill will always be our "go to" contractor and we will gladly refer him to anyone that asks for our opinion. Dear Bill, I want to thank you for working with us. We both totally enjoy our "new" home and sincerely appreciate all of your hard work in making this happen for us. EVERYONE who has seen the results are amazed, especially those who knew what we had before the changes were made. Dear Mr. Cason...Bill, How do I thank the man who transformed a house into a beautiful home? It seems like yesterday we met to discuss the possibilities of a renovation...and here we are, weeks later, standing in the midsts of a dream come true! As I've mentioned before, your confidence in the job, your steadfastness in staying the course, your assurance that everything will turn out great, and your unwavering support are the priceless pillars of your character that have meant the most to me. These are qualities of a man that no amount of money can buy and it is for this reason alone that I am truly blessed for having known and shared this experience with you. I cannot imagine a more perfect person for this project, so thank you. Thank you for your attention to detail, for your honesty, your trust and your commitment to the job. My gratitude for what you have done spillith over. The way I see it, the re-construction of the house was just the vehicle from which your character emerged...and what a "larger than life" character it is! Your team of sub-contractors, as well, compliments the depth of your integrity. May you be blessed all the days of your life! Thanks, Paul did a beautiful job on our new screen room. We are very familiar with the quality of Bill Cason's work. We used him previously to build our detached three car garage. It was at that time that we found out that he was the original builder of our home and also came highly recommended by our neighbor. Our most recent project involved converting our existing garage into an entertainment room and converting our laundry room to a 1/2 bath. When we contacted Bill, he actually answered his phone and we were able to arrange a meeting promptly. We discussed the project and he gave us his suggestions, as well as listened to what we were trying to achieve. Throughout the entire project, Bill Cason and all the subcontractors were always prompt, courteous, and all work was done in a timely fashion. Any last minute changes were easily accommodated, and the quality of the work was excellent. Whenever I called, he answered the phone, and if I emailed him a question, he promptly responded. Our project estimate was very reasonable, but as an added bonus at the end of the project, we were actually under budget! We will certainly use Bill Cason again and would not hesitate to recommend him to others. Hi Bill, I want to thank you for the opportunity to work with you. Your work and professionalism has been great. 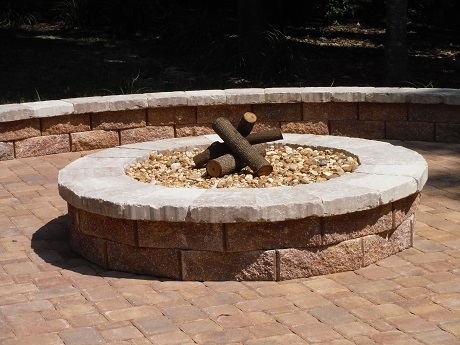 There are not enough good things to say about Cason Builders Inc. of Gainesville, Florida. Bill Cason, owner, as well as every employee and subcontractor that he selected have been top quality professionals to work with. Spending most of my time out of state, and having Cason Builders do a major restoration and expansion on my home, could have been a nightmare. However, there was NEVER a problem. The craftsmanship is absolutely top quality, the eye for details from amazing wood work to new floors, structure and daily cleanup were impecable. The attitude and sense of pride that every single worker both employee and selected subcontractor of Cason Builders was a 15 on a 10 scale. It has been an honor for me to work with the company. Thank you, Mitch did great work. We are submitting your name to our neighborhood association as a reliable and dependable contractor. Thank you so much for the job you did for us, everything looks perfect. I can't wait for you to do more next year. Dear Bill, You built us such a great, custom home and the entire process was such an enjoyable one, that I just had to write. From design through completion, your calm, thorough, optimistic apprach made the entire experience a real pleasure. Your subs were all professionals too, easy to work with, and very dedicated to doing a job we could be proud of. Everything you promised about their abilities was true. We had never built a custom home before, but you helped us along each step of the way, giving us plenty of notice of when each of our choices was coming due. You added such great custom touches with the plant shelves, great tile work, amazing cabinets, and arched doorways. There are just the right amount of electrical outlets too. I love the way each room in this house looks, inside and out,in so many ways. You were very responsive and you came through for us again and again. You made sure the worksite was clean and even supplied us with your own welcome mats. All our friends are very impressed with our home and we couldn't be happier. We have a strong, well-insulated, beautiful home, like no other. Thank you doesn't seem near enough to say because there are so many things that have to be done in the bulding of a house, I see now, but THANK YOU for being such a great builder! Bill, It has been a delight to work with you. The process was mostly painless, and the result was impressive. I also owe a debt of gratitude to the folks you had working with you throughout the project. If I were talking to future prospective clients about you, this is what I would say: Anyone who is considering building a new home in North Central Florida has probably met any number of contractors who will "Build to Suit". However, I really doubt that you will find anyone who is more sincerely committed to that principle than Mr. Cason. I found him to be ready, willing, and able. Mr. Cason will spend the time until the plan agreed on is the plan you want. He is accessible throughout the project, and ready to fairly answer your questions. I am currently enjoying a spacious, gracious home that is very well suited to my lifestyle. I feel that I am very fortunate to have enlisted Mr. Cason to build my home. Ann Barnett, High Springs, Fl. This summer I had the great fortune in having Cason Builders Inc do significant work on the exterior of my home as well as the interior. Throughout it all, Bill Cason was incredible. Over four weeks my home was transformed. New enclosed patio (with beautiful tile floor), soffits around the entire house, rain gutters installed, whole house painted, french doors installed, a new garage door, electrical outlets placed around the outside of the house, large cactus/palmetto garden removed and replaced with high grade sod, chandelier installed, and major electrical work done throughout the house. I cannot be happier with the results, as are my neighbors! The cost was MORE than reasonable and has made my home so much more beautiful. Bill Cason is the finest contractor in Gainesville (this was confirmed by the county's building inspector who said that if all contractors in the area were as fine as Bill they would be out of a job!). He was always, ALWAYS available and did much of the work himself. Thank you Bill for a remarkable job transforming my home! Cason Builders was recommended to us by our realtor. We needed an addition added to our house, like a mother-in-law suite. Bill Cason and all of his subcontractors did a wonderful job. Everything was done in a timely manner, in a professional way, and under estimated cost. Bill was always available when we had questions and took care of any problem that came up. If we ever need another addition or house built you can bet Bill will be our builder. We haven't hesitated to tell people what an incredible job his builders did and will highly recommend him to anyone interested in building in the future!! Thank you for being the best builder in Gainesville!!! Tom and Maggie, Haile Plantation, Gainesville, Fl. Cason Builders did a variety of remodeling for us recently and we couldn't be happier. They installed new windows, new roof, new siding, added a sunroom, and extended our front porch and more. All the work was done in a professional and timely manner. We wouldn't hesitate to recommend Cason Builders to our family and friends. Love It! Pat Caudle, Fort White Fl. Our family bought a 26 acre tract in Columbia County, to be our retirement home. My Brother-In-Law, who is a contractor himself in Indian River County, interviewed a number of local contractors and chose Cason Builders. Bill Cason has worked with us through every stage of development, from road building, to home construction, to landscaping. He and his crew have been consumate professionals. The end product always exceeds our expectations, and often includes tasteful details we didn't know to ask for, but were very glad to have. We still have two more homes to build on the property, and Bill Cason will definitely be the Contractor. We have come to trust and depend on his advice, and here's the crazy part- He always answers his phone!!! How many people can you say that about??!! Thanks, Bill! My wife and I chose Cason Builders Inc. to build our new home in 2005, located in High Springs, Florida. To say we are totally happy with the home and builders would be an understatement. We had a great experience building this home with Cason Builders Inc. and have had a great relationship with these fine people for the years after we moved into the house. Anytime we had a question, the reply from Cason Builders Inc. was immediate and always helpful. Just proof positive that folks at Cason Builders Inc. were willing to respond to their customers after the home sale. Without question we would recommend Cason Builders Inc. to anyone looking to build a quality home and to have builders that care. Bill and Clauida Brown, High Springs, Fl. Cason Builders made our bathroom remodels easy. The service was prompt, professional, and fairly priced. We could not have expected more. My wife and I came to Bill Cason with a partial house plan to build a home for my mother-in-law. Bill worked with us providing useful and economical suggestions to fill in the blanks and improve the design. The project was completed in a workman like manner, on time and for the amount contracted with no surprises except the better than expected quality of the materials and work. Cason Builders was so easy to work with, last minute ideas were no problem, Bill's crew was easy to work with and did the work in a neat and professional manner, not to mention being polite also. We built my mothers house first, and after seeing the quality of work and ideas Bill came up with our home will be built by Cason Builders also. Al and Carl Payne, Rum Island, Fl. As a builder, to us you are the best. We appreciate your professionalism and craftsmanship. Thank you for giving us a home as well as a house. The Bray Family, High Springs, Fl. Just a quick note to thank you and your crew for the great job pouring concrete in our living room. The finished surface is lovely and your crew was punctual and very professional. We'll definitely spread the good word on the great job your company can do. Heather and Hans, Gainesville, Fl. This letter of recommendation for Bill Cason comes well deserved. He was the superintendent when my house was built. From my experience he was very pleasant to work with. With Bill being hands-on, he paid very close attention to craftsmanship, quality, and details. If I had a question he had an answer, which made me feel like my home was in good hands. When it came time for the punch list I was amazed that I could not find anything. 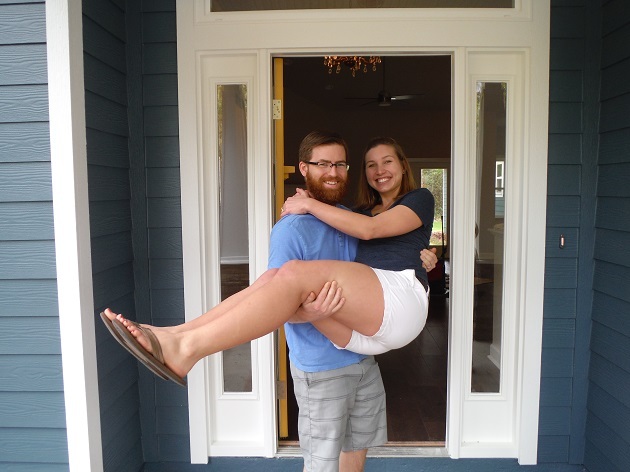 We purchased our home from Cason Builders over 3 years ago and from our first walk through of the house to today we have been fully satisfied with the quality of the construction of our home and the customer service provided by Bill Cason. Cason Builders focuses on even the smallest details when designing their homes. This is evident throughout the house from the color of the tiles that match the countertops that match the lighting fixtures to the custom built cabinets and molding around the doors and windows. Bill Cason himself has come to our home on numerous occasions to see how things are going with the house and quick to respond when we had questions or concerns when we were first purchasing our home. I would highly recommend Cason Builders to everyone who is looking to build and/or purchase a new home. If we ever look to buy or build again we would continue to use Cason Builders! We chose Cason Builders to build not one, but two family homes for us. Bill listened to what we wanted and needed in terms of design, functioality, and budget. His contractors were even easy to work with! He was efficient in getting us answers to questions and concerns. His craftsmanship is second to none and most importantly, he finished on time and within budget. We have received numerous compliments on both houses and are always proud to recommend Cason Builders to others.